"I've always had a taste for a little speed". Mrs Butterworth, "Many Happy Returns". Some of the most enduring images from The Prisoner TV series are those provided by the use of various vehicles involved. The Lotus 7 crossing Westminster Bridge, a Mini-Moke driving along the sands of Portmeirion, a Jaguar E-Type and Lotus Elan racing round the streets of Borehamwood, a Hearse in Park Lane, a Helicopter taking off from Portmeirion. All images indelibly linked to The Prisoner. The Unmutual Website presents a guide to all these legendary vehicles, and many more besides, and the parts they played in the Series. Click on the links or images to see more detailed information and images of these vehicles. 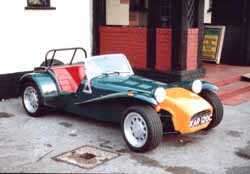 Number Six's sports car, seen throughout the series and in the opening sequence. The Village Taxis, seen throughout the series. Sonia's car from "The Girl Who Was Death". Number Six's car from "The Girl Who Was Death". Potter's car from "Do Not Forsake Me". A's car from "A, B, and C". Engadine's car from "A, B, and C". "The Girl Who Was Death" helicopter. MS Polotska, and the Gunrunners' boat. The Village symbol and Green Dome resident. Seen in "Many Happy Returns". The "Many Happy Returns" Jet. The "Fall Out" escape truck. The "Free For All" Speedboat. The Bulldozer from "The Girl Who Was Death". Fire Engine seen in "Many Happy Returns"
STOCK FOOTAGE: Several other vehicles appear in The Prisoner which are taken from stock/library footage (provided by World Backgrounds). These include the "Maid of Kent" Ferry at Dover in "Do Not Forsake Me Oh My Darling". OTHERS: If anyone has any brief details concerning the Transportation Lorry in "Chimes of Big Ben", the Netco Truck or Rolls Royce driven by Thorpe and The Colonel from "Many Happy Returns" (registration 8642 MU), the Speedboat seen in "The Girl Who Was Death", or the Bentley seen in "Fall Out" (which was McGoohan's own car) please contact us as we'd love to see them included in this guide. The Unmutual Vehicle Guide was written and compiled by Rick Davy, with additional text by Steve Dix (Lotus 7), David Jarrett (Elan and Spider), Nigel Kitcher (Moke), Pete Shimmon (RSW 16), and David Healey (Blue Streak). All photos featured in this section of The Unmutual may not be reproduced without prior permission in writing. Photographs supplied by Rick Davy, David Healey, Mathew Lock, James Groom, David Mackenzie, Funkyjudge, Steve Dix, Wisp owner Giles, Number 66, Marc Gerges, Bob Gunton, John Edwin Lee, Anja Christen, Peter Quinn, Paul Brady, Paul Boxmeyer, Brian of http://www.dowtyjetboat.co.uk/ John King, and Joey Rhodes. Thanks also to Neil Markwick, Ronnie Soo, Ken Butterfield, Simon King, the members of the Milko Yahoo Group, Paul Bradshaw, Steve Brant, Michel Ballet, Ian Bruce, Jason Skufca, and Roger Goodman for the additional information. If anyone has any additional images or information regarding any of these vehicles, or indeed any others we might have missed, please contact TUW .